Take creamy avocados to a different level with this stuffed avocado recipe! 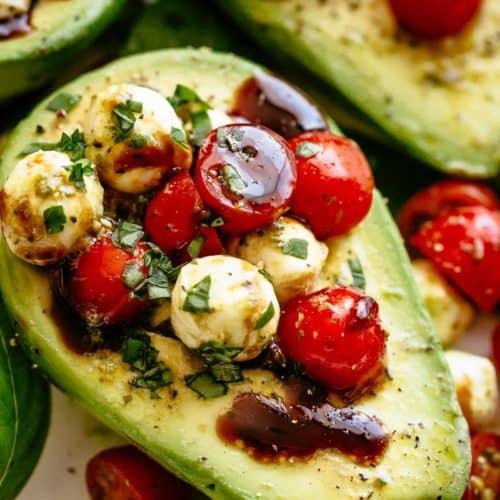 Sweet and juicy grape/cherry tomatoes with fresh mozzarella balls are tossed in basil pesto with a touch of garlic, then stuffed into avocado halves! Drizzle with a balsamic glaze for an incredible flavour combination. Seeing Caprese stuffed avocados all over the internet lately, I wanted give them a try and I’m so glad I did! Fresh mozzarella and juicy tomatoes are the perfect match…especially when combined with a touch of pesto (home-made or store bought) and a kick of garlic! Stuffing creamy avocados with a Caprese mixture though is pure heaven. 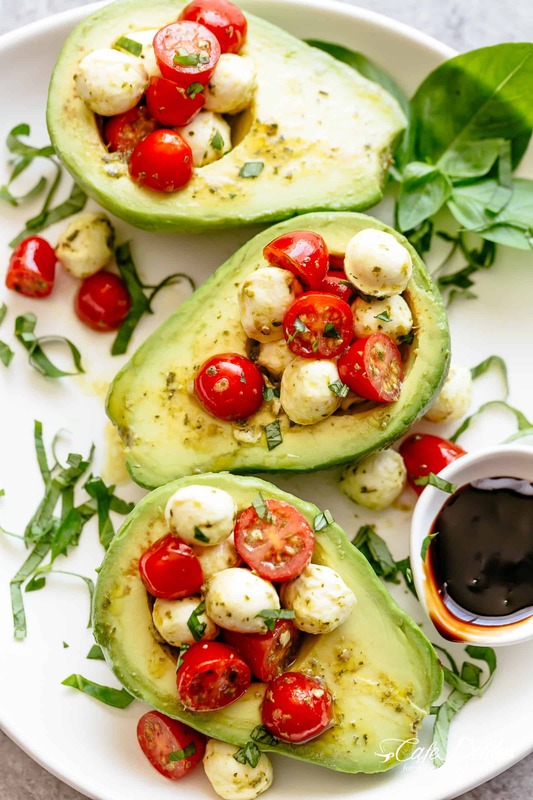 This recipe is almost similar to combining this Chicken Avocado Caprese Salad with this Pesto Grilled Chicken Avocado Salad with an ultimate twist. 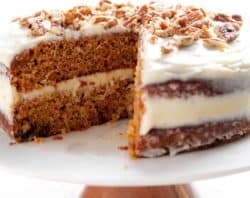 Easy to make, easy to eat and AMAZING! 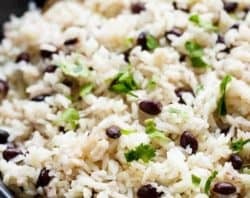 For similar recipes, try these! 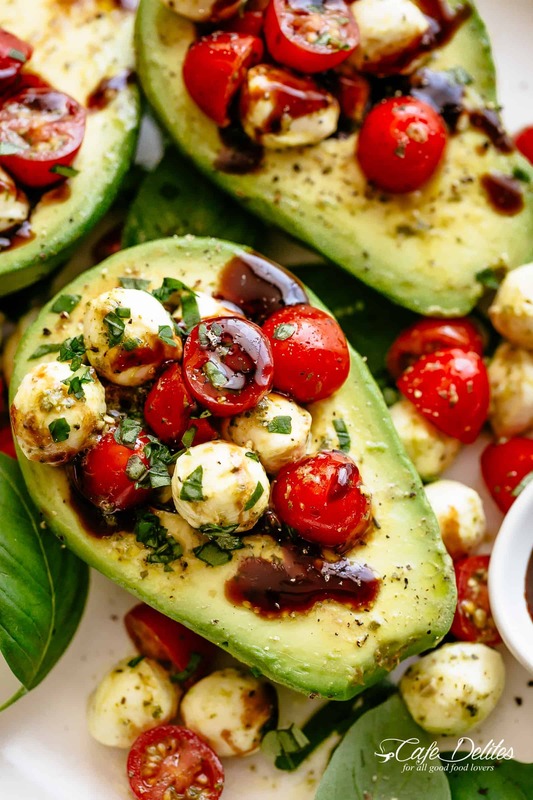 Watch us make Caprese Stuffed Avocados Right Here! 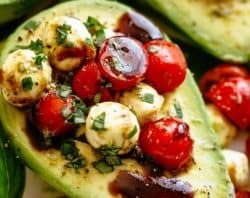 Sweet and juicy grape/cherry tomatoes with fresh mozzarella balls are tossed in basil pesto and a touch of garlic, then stuffed into Avocados for an incredible light lunch, dinner or snack! Drizzle with a balsamic glaze for an incredible flavour combination! 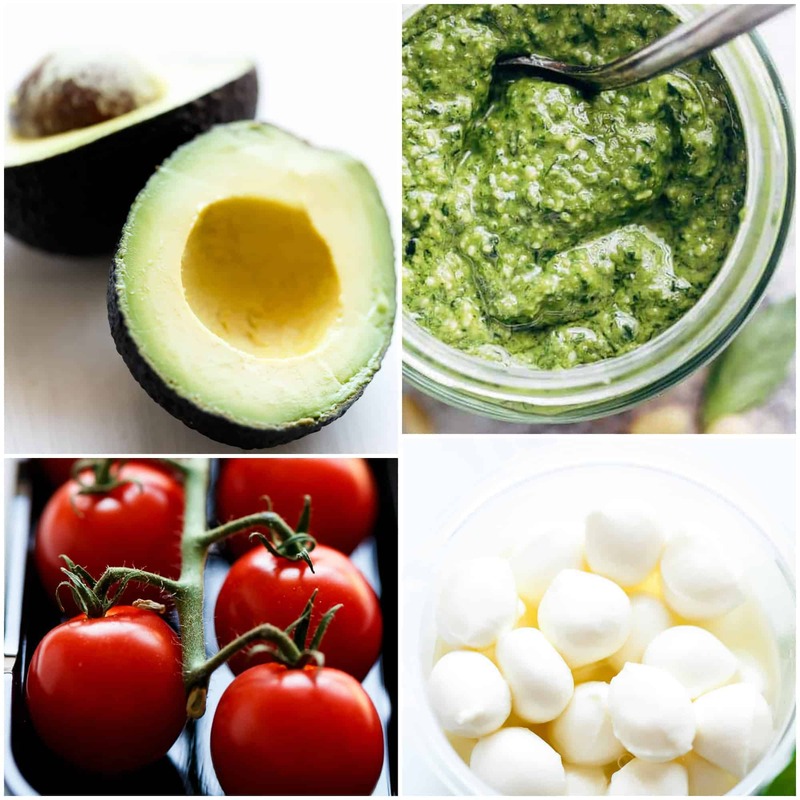 Combine tomatoes, mozzarella balls, pesto, garlic, olive oil, salt and pepper in a bowl. Toss well to evenly combine all of the flavours. 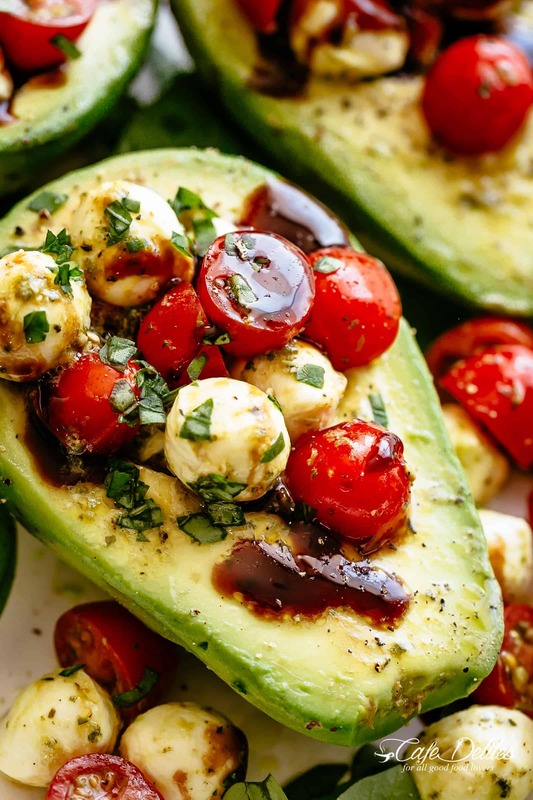 Spoon the Caprese filling into each avocado halve and drizzle with balsamic glaze. Top with chopped fresh basil. Serve immediately. Made tonight for dinner. Loved this salad so much. Served with steamed shrimp and tandoori bread with black bean hummus. Delicious. I just discovered your sight and can’t wait to try more. Thank you!! OMG this was Fabulous!!! I had to use store-bought glaze because I’m not good with reduction. Thanks for sharing this! Making a balsamic glaze is easy. Just take balsamic vinegar and put it in a sauce pan. Bring to a boil and reduce it! The final result should cling to a spoon like syrup. A word of warning. I did this with a large amount of vinegar which took a LONG time. But I wanted it to last for awhile! It stunk up the house but good! So don’t do more then a cup, or something like that, at a time. ? We made this tonight over here in Europe. It was a big hit for both my wife and I. Another avocado is sitting and awaiting round 2 tomorrow. Where is the recipe? Am I missing something? There’s only a photo and a brief paragraph but no actual recipe. Thank you for letting me know! I am so sorry that the recipe went missing! My site had a malfunction for a period of time today and we are just getting things up and running. I apologize for the problem and how long it took. Thank you for your patience and following along with me! If you have any other questions or concerns please email me and I would love to help in any way that I can. XOXO Here is the recipe: https://cafedelites.com/caprese-stuffed-avocado/. How do you make homemade balsamic glaze? How do u make the balsamic glaze reduction? 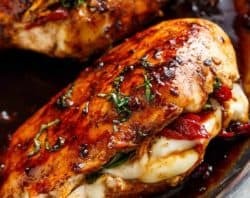 The balsamic glaze can either be homemade or store bought. Hope that helps. It is a nice and light meal for the summer. Thanks so much for choosing one of my recipes. You can either make a balsamic glaze or use a store bought glaze. Hope that helps!! So I’ve had a lot of caprese salads before and they’re great but this is on a whole nother level. I loved this so much, I can’t wait to make it again. I served the stuffed avocados on a bed of arugula and cheese tortellini. My husband was not looking forward to it, he hates salad and loves meat and potatoes, but he loved it. 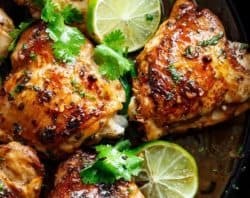 I love quick dinners like this and will make this again and again. Thanks so much for the recipe! That is so great to hear! Thank you so much for sharing and following along with me! 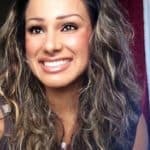 I continue to share your website with my friends because it is awesome!!!!!! 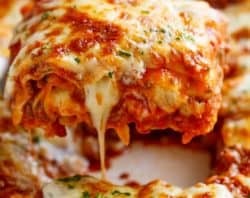 Every recipe I have tried tastes great! Thanks for your passion. It has reenergized my cooking!